Child Life Specialists help normalize the hospital experience and bring joy and comfort to hospitalized kids and their families. Many of the funds raised by CMN Hospitals are used to fund Child Life programs and help make up the gap between what government and insurance pay for and the actual cost of caring for kids in our member hospitals. Jaime McCaffrey knows that every Child Life Specialist can have an immeasurable impact for good on the patients and families they serve. For Jaime, being a Child Life Specialist isn’t just a career choice. It’s a calling. With infectious enthusiasm, Jaime connects with her patients through sincere kindness and out-of-the-box imagination. Her creative ideas make the hospital a fun—not scary—place to be. One summer, Jaime realized that children who were hospitalized during summer were missing out on the typical summer camp experience. So she decided to bring camp to the hospital. Camp Week was a huge hit, with custom T-shirts, nerf archery, s’mores, picnics, a “drive-in” movie, and medals and trophies throughout the week. Patients also voted for one doctor and one nurse to slime at the end of the week. Jaime won the vote, and always a good sport, donned a hazmat suit and goggles to have 5-gallon buckets of bright green slime poured over her head by delighted patients. Camp Week was such a big hit that several patients requested to be admitted to the hospital again the following year so they could participate! Jaime’s dedicated attention extends to each individual patient. When one of her patients only wanted to eat pickles, Jaime went shopping and brought back every type of pickle she could find. When another patient shared that his dream was to meet a penguin, Jaime arranged for a personal penguin meet-and-greet in the hospital parking garage. As she works with patients and their families, Jaime involves community members and gives them an opportunity to spread joy, too. Vicki Murray owns a cupcake shop, Laugh Loud Smile Big, in nearby Rockport, Maine. With Jaime’s help, she began donating themed treats to celebrate patient birthdays, final chemo treatments, and holidays. 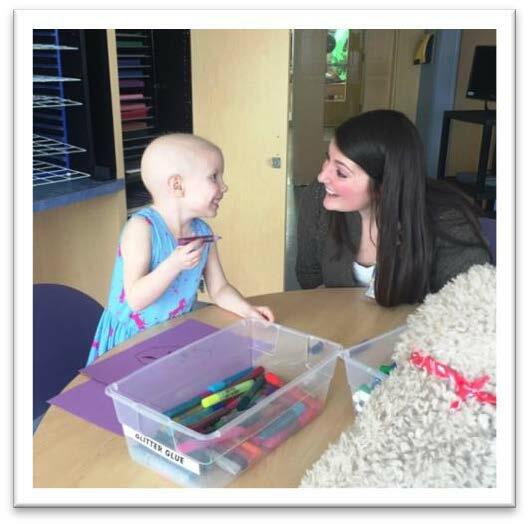 Soon, the “cupcake lady” was hosting cupcake decorating activities for patients, and at least once every visit, helping a child decorate a treat for their “best friend”—Jaime. Vicki’s teenage daughter was so inspired by Jaime that she decided to study to become a Child Life Specialist, and she’s not the only one. Many of Jaime’s former patients and their siblings have decided to follow in her footsteps and help other families just like Jaime has helped them. Jaime enjoys good coffee, costumes, and silly string. When she isn’t sprinkling fun through the halls of the hospital, she loves spending time with her husband Phillip and her dog Molly.